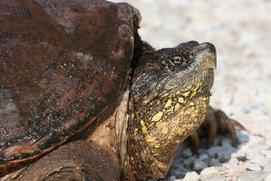 The following entries are from the McGills continuing exploration of Seney National Wildlife Refuge located in the Upper Peninsula of Michigan. This Refuge holds a special place in the hearts of Michael & Teresa. It is, in fact, a 'refuge' for them providing them with a peaceful, serene place to do what they love most-photograph and film Michigan's wonderful wildlife. After spending our last morning along the tracks of the Toonerville Trolley we head into the Refuge around 1:00pm. 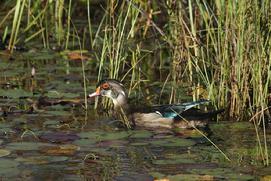 We only have one male wood duck in his fall breeding plumage on the small pool in front of the Visitors Center. I was hoping for a few more than that…but I still have two days to find more. There is an abundance of Canada geese on F pool along with a gathering of ring-necked ducks and a few pied billed grebes. 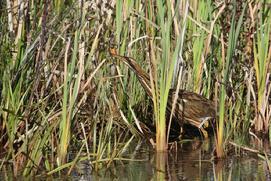 We were really excited to find an American bittern in F marsh. It must be lagging behind or migrating through. They are usually gone by now. Unfortunately, someone was ‘pushing’ us so I tried to get out of the car…but it quickly dodged into the marsh. As we approached J Pool we were excited to see the great egrets were still hanging out. 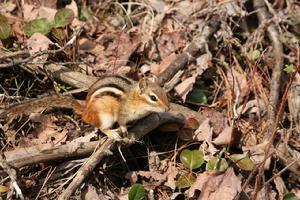 There has been upwards of ten of them seen at one time…an all-time high for the Refuge. Since they lowered J Pool all of the invertebrate eaters have been enjoying the feast. Great egrets, great blue herons and the sandhill cranes are really spending most of their time right here. We have an egret really close to the shore…and the same car on our bumper…so I get out so Michael can park the truck further down the drive. I slither down into the brush and eventually onto the shore. I sat there for probably an hour just enjoying the show. The great egrets are very comical to watch. They will circle the area…then one will fly to a different spot…so they all have to fly to that spot. Eventually they always came back to where they started. I was able to get some really cool shots of them together and flying. The sandhill cranes were entertaining Michael. One pair would fly in and another we go after them trying to make them leave. We found that interesting since it is fall migration time and they usually are social by now…bowing and greeting each other. The kingfishers and bottom feeding waterfowl are also enjoying the lower level of the pool. We finally decided to continue on to see what other creatures we could find. Northern harrier, a sharp-tailed grouse, hairy woodpeckers, yellow-rump warblers and more were enjoying the wooded area along the Fishing Loop. C Pool had lots of wood ducks feeding but too far out for any photo ops. Our little pied billed grebes were eluding. As soon as we stopped they submerged…moving out farther in the pool. The three juvenile common mergansers are still around and doing well. There are lots of ring-necked ducks throughout the Refuge. As we make another run through, we decide to just sit and enjoy the party on J Pool. 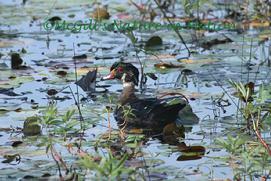 Now we have a large number of American widgeons feeding along with mallards, Canada geese and hooded mergansers. 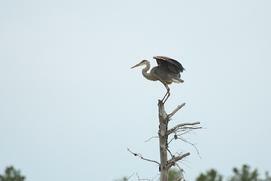 A great blue heron is on an island with trumpeter swans, Canada geese and mallards. The great egrets are out feeding quite near the fishing pier. We decide to nest in and just enjoy the show. What fun to watch the interaction of the waterfowl and wading birds. We got a call saying that if the Congress didn’t finalize the budget that the Refuge would be closed at midnight. Well, we decided to stay until the bitter end. We are so glad we did. The clouds moved in and we thought that was the end…but there was a sliver of clear on the horizon. As the sun set the color was amazing over J Pool. The wildlife continued to feed. One great blue heron actually came right close to me…not really caring that I was there. It was truly magically and bittersweet knowing that the Fishing Loop would definitely be closed tomorrow, October 1, and possibly the whole Refuge. This may have been our final sunset on the Refuge. It has been a great season…every one different than the other. 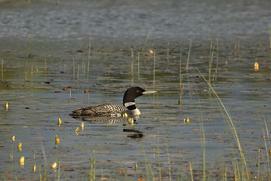 The common loons were successful …seven out of ten chicks…as far as we know survived the season. 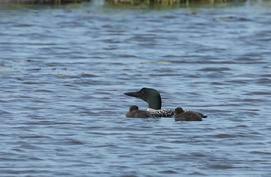 ABJ at 26 years old was once again a successful father of two loon chicks. E Pool eagles did not nest this year due the cold unpredictable weather. But yet two pair of ospreys had successful nests. We had a minimal amount of pied billed grebes but finally started to see more great blue herons. 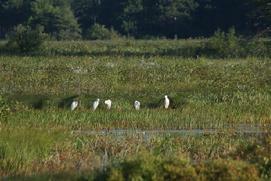 We even were treated to over a month of up to ten visiting great egrets. As we have experienced for over twelve years…no year is ever the same. There is always something new to see and experience right here on “our” Refuge. Here’s looking forward to 2014! Finally we have a beautiful tranquil morning on the Refuge. The water is like glass as the sun reflects off of it. Now we just need something to photograph. 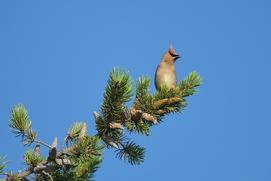 There are lots of little pine warblers, northern flickers, and other songbirds out enjoying the calm morning, too. As we round the Fishing Loop we have two beavers out enjoying the peace and quiet of a Tuesday morning. 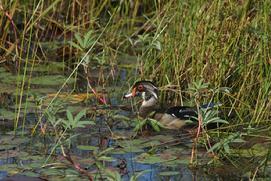 A few wood ducks are feeding in the marshes on E Pool. H Pool has pied billed grebes, Canada geese, trumpeter swans and a noisy kingfisher. J Pool is the hot spot on the Refuge lately. 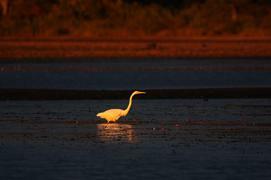 It has been playing host to five great egrets for that last few weeks. 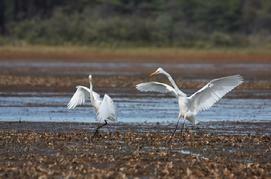 We have seen two egrets at a time in years gone by…but never five at one time. So it has been fun to be able to photograph and observe their behavior. Their cousins the great blue herons are real happy to have them visit. 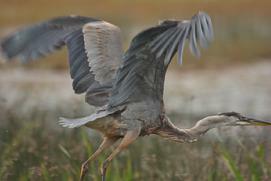 We enjoy over an hour of entertainment with the five egrets and five great blue herons along with some sandhill cranes. First two the egrets moved into an area where I was stationed. Before long a great blue flew in. Then one by one all five great egrets and all five great blue herons were gathered in the same area. All of a sudden the winds picked up out of the south and the clouds started moving in…that in turn go the birds all a flutter. They all took off flying every which way. We thought they had gone to the other end of the pool but as we were driving toward the bridge we spotted a young great blue sitting on the rail. We stopped to photograph it. It just acted nonchalant with its plumage blowing in the wind. All of a sudden it stood up. 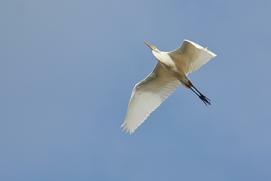 Right over the top of us flies several of the white egrets and great blue herons. They started kittling above us….flying every which way. Very cool to see and photograph. Then as quickly as they came…they left…then as we started to drive forward our little great blue flew off and down into J channel. What a great morning on the Refuge!! Well, the clouds are taking over making it more difficult to operate the camera settings. First sun, then clouds then both….I guess that keeps me getting bored. G Pool is quiet as is E Pool except for a little pied billed grebe. D Pool has an eagle sitting on the old osprey nest platform. The woodies are still feeding way out in C Pool where a great blue heron just flew in. A pileated woodpecker flew over us to the other side of the pool. We decide despite the clouds to take one more quick run through before we have to head home. 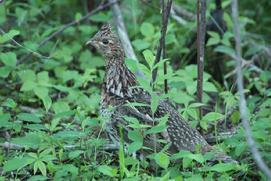 We finally spot a sharp-tailed grouse along the drive by J Pool where a momma hooded merganser has one growing chick. The great egrets and great blues are scattered around the area. We stop to watch one at the far end of J channel. We also spot the one that looks to have a broken leg on G Pool. It tries to land in a tree but can’t hold on due to the strong wind. We also spot a mature eagle soaring over G Pool as we watch it heads off to the north. Then a 4th year eagle comes soaring over. It’s nice to finally see some eagle action. We have missed the eagles having young this year. The parents are kept busy trying to feed the young and therefore doing a lot more fishing along the drives. Oh well, next year will hopefully be better. We head back to the Visitors Center to check on the wood ducks. Lucky for us our friend Pat Foldenaur was heading into the Refuge. We get to have a nice chat with her before leaving the Refuge for home. We won’t be back up till the last weekend of September. It gets harder and harder to leave knowing that our time is limited to just three more weekends here. After a cold windy morning along the tracks of the Toonerville Trolley we finally head into the Refuge around 2:30pm. The great blue heron is still hanging out in the small pool along with a few wood ducks. As we start the drive we spot another great blue heron in F Pool. The little pied billed grebes are feeding along with a couple of ring-necked ducks. 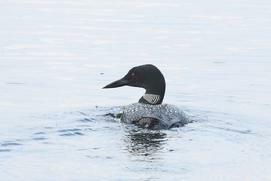 No signs of the loons on F, H or J so hopefully that means they have already headed south for the winter. H Pool does have a few pied billed grebes and a great blue heron on it. J Pool is still hosting the five great egrets and some great blue herons along with ring-necked ducks, Canada geese, trumpeter swans and sandhill cranes. Further down near the channel we have more sandhill cranes and a screaming merlin. 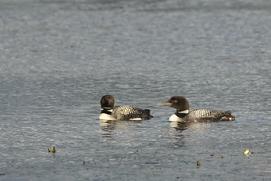 We spot a pair of juvenile common merganser on G Pool but not much of anything else. The wood ducks are feeding out in the reeds on C Pool where a great blue heron is fishing. 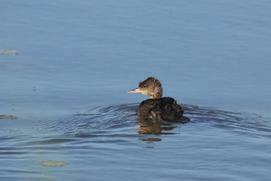 We still have the pied billed grebes popping up around the pool. Unfortunately they haven’t been very co-operative for photo ops. Our evening run through we found a doe and two fawns in F marsh. The fawns have lost their spots and getting bigger ready for our harsh winter. And we finally spotted the D Pool loon out feeding its young chick. 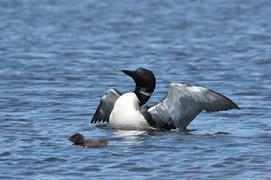 The D Pool loons had to re-clutch which makes their chick about a month behind the other loon chicks. 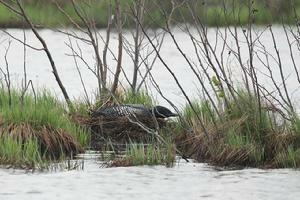 Hopefully we have a mild fall and this one, too, will survive to help increase the dwindling loon population. The botulism found in the algae on Lake Michigan has drastically decreased the diving waterfowl population the last few years. Unfortunately the weather took a turn for the worse…cold wind and rain. We tried out running it and heading west but…no luck. We finally came back and made a late run through the Refuge. 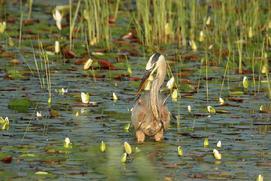 The young great blue heron is fishing in the small pool in front of the Visitors Center along with the many wood ducks. We finally have pied billed grebes back on the Refuge. Several of them are on F Pool…submerging like submarines. I love to see them doing that. There are also a few trumpeter swans scattered around. E Pool has kingfisher and flickers flitting about. 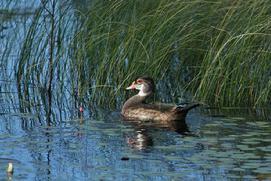 Wood ducks are bobbing back and forth feeding in the reeds. 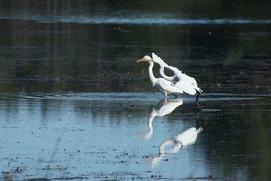 The five great egrets are still hanging out on J Pool along with their cousins the great blue herons. Now that they have lowered the levels of the pool it makes it much more accessible for them all to eat along with the sandhill cranes. As we start to cross the bridge we spot a great blue heron. I was able to just pull back my lens to get a shot off as it flew out. We have a little merlin along G Pool. Our local ones have already gone but since the little birds are migrating so are the little merlins and hawks that feed on them. 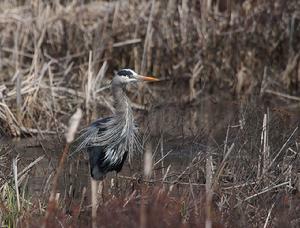 We have a great blue heron in C marsh along with some wood ducks. 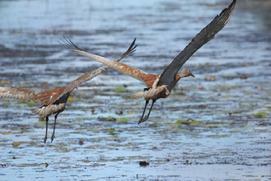 A pair of sandhill cranes flies off the drive into B marsh. 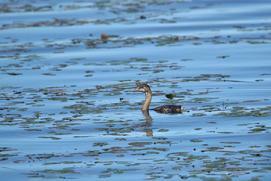 Several pied billed grebes are feeding along C Pool. We have ring-necked ducks, wood ducks and pied billed grebes at the end of C Pool. 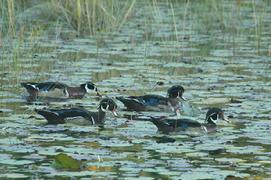 There is a number of wood ducks feeding in the marsh. Of course, they are always there when the lighting isn’t good. Hopefully, tomorrow will be a better day. But even on a gloomy wet cold evening…there is lots to see on the Refuge. After a lovely morning with the black bears along the tracks of the Toonerville Trolley we finally head into the Refuge around 2:00pm. We meet up with friends, Bud and Louise Olson, from Mears. Louise rides with me while Michael rides his chair and Bud follows in his truck. When we first get there though, we spot the wood ducks enjoying the small pool in front of the Visitors Center. There is also a bald eagle soaring over V.C. 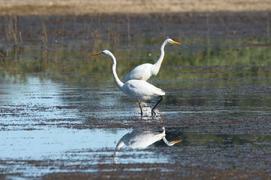 Louise and Bud told us that the five great egrets are still hanging out on the Refuge. And that the loon chicks are all still alive including D Pool’s very late chick. It’s a little quiet at this time of day. We spot a great blue heron flying over E marsh. A pair of sandhill cranes is feeding in J marsh. They take off and fly back farther in. 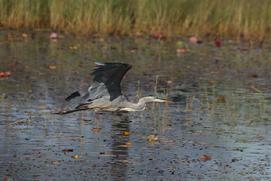 Another great blue heron is feeding in G Pool. We also have a pair of bald eagle soaring high above the pool together. As we round the corner we have two great blues in the west end of E Pool. The west end E Pool trumpeter swans still have three of their six cygnets which is actually good compared to previous years. You see this year the eagles did not have young…so the cygnets had a better chance at survival. We also spotted a broad-winged hawk at the west end of E Pool. We spot a wood duck or two out in C Pool along with a great blue heron. Further down we also spot a pied billed grebe or two. We end our first run through and say good bye to Louise and Bud as they headed home and we headed back around the Refuge while the sun was still shining. The wood ducks along with a great blue heron were in the small pool by the Visitors Center to greet us. A pair of kingfishers is having a squabble over F Pool as a merlin flies over them. 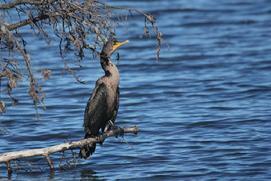 We also have a cormorant in F Pool. The west end of E Pool has a pair of pied billed grebes along with another kingfisher. 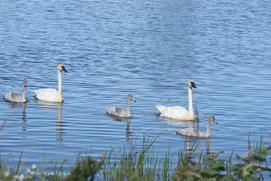 The west end trumpeter swans with their three cygnets are at their island. But a squabble takes place as a goose has taken up residence on the island. Well, that doesn’t last long…as the swans run it off. We have lots of wood ducks out feeding in C Pool. Further down we spot red - tailed hawk hunting in B marsh. The pied billed grebes are still out in C Pool but too far out for photos. We end our day…but will be back next weekend for three days…so hopefully we will get to spend a little more time here. It was an overcast cool morning as we headed back to our blind along the tracks of the Toonerville Trolley. No one was there to greet us…not even the ravens. Finally they showed up along with one mature eagle. We also were serenaded by several hundred grackles that were migrating through the area. They would take turns feeding on the corn to the north of us. The blue jays were starting to flock up entertaining us with their diverse vocabulary. Sandhill cranes started to fly in to the north of us finally. One pair had a colt with them. We were entertained with all the interaction between them and two other pairs that didn’t have young. The pairs without young seemed intent upon making the other pair miserable that had the young. Jealousy? One sandhill even flew at them with its feet extended just like an eagle does when it is being aggressive. Being able to witness this kind of behavior is one of things I love about what we get to do. We always think of sandhills as being very nonaggressive. What’s that about not judging a book by its cover? HMMMM. Finally around 10:00 we spotted Momma Blaze and her four roly poly cubs clear down at #1. The little buggers…we are hopeful they will find out there are not treats there and head our way. So we waited…and waited…and waited…but no Momma Blaze and cubs. It wasn’t until the noon train was coming that Momma Blaze stepped back on the tracks…again…clear down at #1. One by one her four cubs lined up next to the tracks. At least the final noon train of the season got to see them. We hoped they would head our way but…the thunder started to rumble and rain started to fall. We decided we had better book out of there before the train came back. Sitting in a metal structure during a thunderstorm is not a wise thing to do. So we called it a day and got back to the depot before the heavens opened up and the rain came pouring down. We woke up to partly cloudy skies and wind. We headed into the Refuge around 8:45am. A pair of sandhill cranes greeted us at the entrance. The marsh bushes have a lot of little birds flitting around. The kingfishers are extremely active, too. The trumpeter swans and Canada geese are just chilling out on F Pool. As we start the Fishing Loop we spot ABJ with one of his chicks. They are feeding along the shoreline but the wind is so gusty and clouds so thick it was hard to get any descent shots. 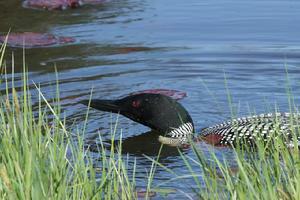 Another loon was calling as it was flying…ABJ immediately went into his defensive mode…lying low in the water. A great blue heron flies over from E to F Pool as well as one of the F Pool ospreys. Another osprey flew into to the nest with a fish for the hungry chick. The sun is in and out due to the strong north wind that is blowing the ever increasing clouds around. 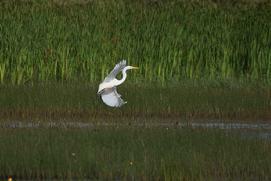 One of the great egrets flies into H Pool. We watch it for a while till in flies over to the backside of J Pool. The other egret is already over in that area feeding. We stopped to but on our winter coats at this point. Brrrr, it definitely feels like October out there today. 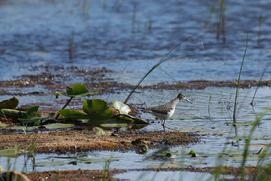 We spot three solitary sandpipers feeing at the end of J marsh. We stop and watch them for a while then headed into the wooded area. There we spot a white-tailed doe eating some mushrooms. The sun light filtered in through the trees right on her sweet face. There is Caspian tern fishing over G Pool where the Canada geese and the trumpeter swans are feeding. 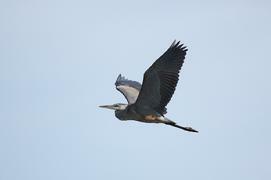 A great blue heron flies over from E Pool to the backside of G Pool. One of the loons is out in the middle of the pool. And yet another great blue heron flies over from E to G Pool. D Pool loon with its young chick is out feeding it on the northeast corner. Unfortunately it is still too far out for any good photo ops. 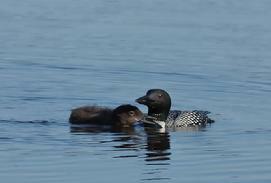 It just hasn’t been my year for getting shots of the young loon chicks. The young Caspian tern is still out on the little spit of land on B Pool. Hopefully its parent is still tending to it. A wood duck in eclipse is out feeding on the end of C Pool. 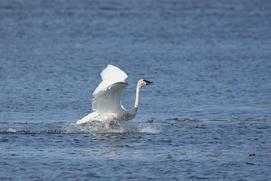 While we are watching it a trumpeter swans flies in and lands right in front of us. That spooked the wood duck so it flew in near the cove. I tried to sneak up on it and two other males but they spotted me and flew off. Maybe next week I’ll have more luck. We head out of the Refuge around noon but will be back next Sunday with our great niece and nephew who are five and eight years old. We spent the most of the day at the Toonerville Trolley hoping to see our black bears but the weather was cold, rainy and windy. We headed into the Refuge for an evening run with temps in the sixties and still windy. The clouds were moving quickly causing for unstable lighting. ABJ was near the spillway on F Pool with both of his young. They are getting so big now…but they were both pestering the heck out of their dad. We had a Wilson snipe fly over the road from H Pool into F marsh where our blue-winged teal female was hanging out. We had three kingfishes having a confrontation along J Channel. They finally split up each going their own way. There was also a sandhill crane with a colt on the island in the middle of J channel. Another pair of sandhill cranes was out along the G marsh feeding. We stopped on B Pool to check the juvenile Caspian tern. It was still just sitting on the island waiting for its parent to return. While we were watching the tern we spotted a loon quietly nestled in the lily pads trying not to be noticed. The reason…another loon was diving around the island. Eventually the one came over to the other was ‘hiding’. They socialized for a while then headed out into the pool. It is always amazing just to stop and watch nature in motion. 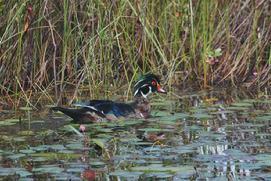 We also had a male wood duck in eclipse in the area. It got spooked off by the one loon but returned after the loons got together. The beavers were also busy along the shoreline tending to their own business. We also had a pair of sandhill cranes fly in and land on the other side of the pool. The clouds were filling quickly in but I was still able to get some descent shots. All of a sudden we heard a loon calling and flying. It actually came in and landed with the other two loons. 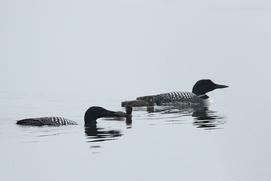 So we had a loon party of three for a while. Eventually the one loon took off flying over us. 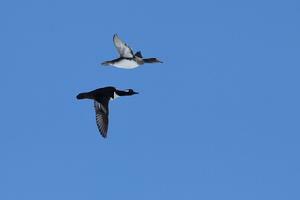 It wasn’t long before the other two loons both fly off, too. It was getting dark so we didn’t hang out to see if they returned. We woke up to a gorgeous morning. We headed into the Refuge around 8:15 am. It is 50 degrees and sunny. The trumpeter swans are enjoying the beautiful morning on F Pool. We spot the F Pool loons with one of their growing chicks. 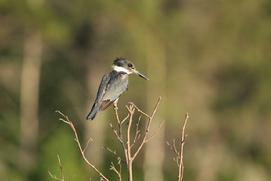 The Eastern kingbirds and kingfishers are really active this morning. We even spot a male red-winged blackbird all alone. 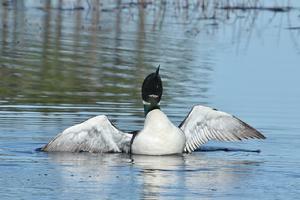 The loons are flying and calling!! One landed on the east end of E Pool. Still not as much activity as there usually is this time of year from the loons. 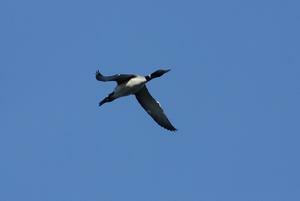 August is the month the lady loons start to gather preparing to leave their families for their wintering grounds. The males leave in September unless a few of the good dads stay and hang out with their young. The F Pool young osprey is hungry and letting its parents know it. We have sandhill cranes raising a ruckus in E marsh. Now we know why…there was a coyote passing through. The sandhills didn’t fly off so that might mean they have a young colt. The H Pool loons are out in the middle of the pool…so no photo ops there. J Pool loon is out with its growing chick too far also for photos. We had a heads up from Mark Wilson with the Youth Conservation Corp that there were a couple of great egrets around the end of J Pool yesterday. Well, they are still here!! 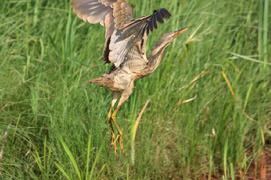 We actually photograph one that is playing hopscotch with a couple of its great blue heron cousins. The herons don’t seem too happy about sharing their feeding grounds with these intruders. We spend about an hour watching them interact. They eventually moved fairly close to us. 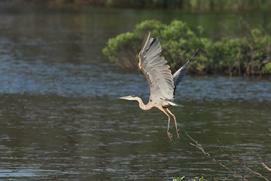 The one great blue heron got tired of fighting for space so it flew off to the south. Eventually, the great egret flew off in the same direction leave the other great blue to enjoy its own space. While we were watching the egret I had a kingfisher that was knocking itself out trying to catch breakfast. The poor thing kept slamming into the water and coming up empty. 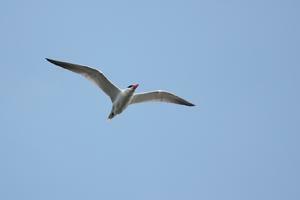 We also had a Caspian tern fly over. We haven’t been seeing them around here lately. They may be migrating through already. 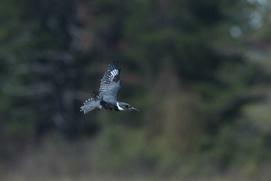 While we were watching the loons a young osprey was circling around screaming for someone to feed it. It landed in the top of a pine tree at the north end of G Pool and just kept screaming. Finally two other ospreys flew over but they ignored the youngster. That is called tough love. I’m sure they are trying to teach it that is has to start learning to catch its own food. It finally took off after the adults. 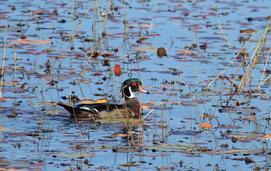 We spot several male wood ducks in eclipse…molting into their fall breeding plumage. 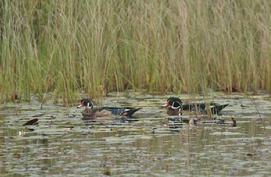 A lot of the wood ducks are on C Pool in the marshy areas. There is also a great blue heron amongst them fishing. Further down we spot the lone pied billed grebe but no young ones. The C Pool loons are out and about but not near the shore. There is an osprey fishing at the end of the pool as a loon flies over. We end our first run at 11:15 am. Our second run through we spot our American bittern feeding it is usual spot around the same time as we usually see it….maybe just a coincidence. 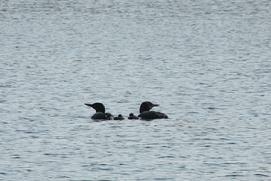 Finally we saw F Pool loons with both of their chicks together. The one chick appears to have a lot more independence than what they usually show at this time. That will be great for it when its parents leave it later in the fall. The other chick is hanging right tight to one of its parents at all times…which is more typically of the young. The trumpeter swans and Canada geese are nestling in for a nap on the islands. It’s clouding up a little more. We have two great blue herons fly right in front of us. One of them is trying to get the other one to leave it alone. It finally settles on top of one of the dead trees along F Pool. We find out it is a juvenile great blue. I guess its parent, too, is practicing tough love. We are able to get some nice shots of the juvenile before it takes off. Poor thing…as it flies off two kingbirds start attacking it. 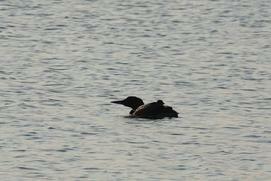 The H Pool loons are out a little closer to shore but not enough for good photos of their of young. The chicks are going through their ‘ugly’ stage…losing their baby down. The kingfishers are really active today. The great egret is still hanging out at the end of J channel. It is definitely quieter at this time of day. No signs of D Pool loons and chick. We finally spot a doe along the peninsula at the end of C Pool. 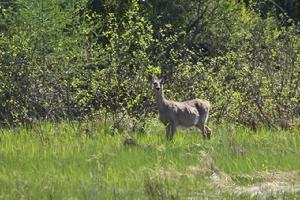 We just are not seeing the deer and fawns that we usually see. We head out around 1:30pm to take a break and see if the weather clears back up. 3:45pm and the clouds have parted for the time being so we decided to make another run through. There is a beautiful male goldfinch feeding on the thistles at the start of the Marshland Drive along with a busy hairy woodpecker and some cedar waxwings. We spotted the F Pool loons with their one chick out farther. 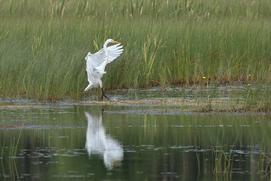 One of the great egrets is fishing along an island on H Pool near some trumpeter swans. 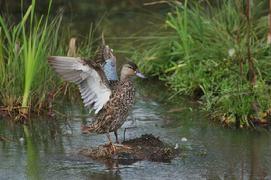 We stop to watch a female blue-winged teal preen herself in F marsh. At first glance they appear quite plain but when you really look at their feather patterns…they are quite beautiful. We still have one of the great egrets out fishing at the end of J channel by itself this time. We sit and watch it. They are much more active than their cousins the great blue herons. We were going to take off but as soon as we started the egret flew in closer. So we decided to sit still and watch it a little longer. It paid off as I was able to get some nice flying and landing shots. They are such exquisite creatures. You can understand why the ladies at the turn of the twentieth century coveted their plumage for their finery. OK maybe not me but people back then didn’t care if they killed off these beautiful creatures. Thank goodness we have come to our senses and protect our national wildlife treasures. We have an eagle sitting in a tree along across G Pool. The loons are back together chilling out. We spot a common tern back in the area. They, too, have been gone off the Refuge for a while now. We spot our west end E Pool trumpeter swan family and their four growing cygnets out on their ‘safe’ island. Yeah, D Pool still has their little chick with them. We are hoping it will make it. It was born awfully late in July. It is going to need a major growth spurt to get it ready to fly off later this fall. We have an adult and a juvenile Caspian tern on a small spit of land on B Pool. They have been there all day. The young one is actually lying down with its head stretched out in front of it. At first it looked to be sick or injured…but it was fin. OMG!!! We finally spot a pied billed grebe with a chick at the end of C Pool along with a wood duck with some very small chicks. We are going to try to make another run through to see if we can get any shots. The momma grebe sent the baby into the brush pile so we could get any shots this time. So back around we go taking the Marshland Drive. We spot a lone loon at the east end of E Pool. Further down the loons still have their growing chick. The D Pool loons are out near the shore, of course, in the bad lighting with their young. But all of a sudden out of a tree along the drive flies a mature bald eagle!!! It makes a swoop over the loons. The poor loons are yodeling trying to scare off the eagle. Luckily I think we did the scaring off…but either way it was a good thing. Our clouds are moving in fast. We finally get to the end of C Pool and find out fairly large pied billed grebe chick. It showed off for us for some time before heading out to its parent. We ended the run on a very happy note at 7:15pm. It is a gorgeous morning on the Refuge. The temps are in the mid-fifties at 8:15am without a cloud in the sky! F Pool loons sadly only have one chick left. It is always sad when they lose one especially when it was already a month and a half old. It has lost all of its baby down and is sporting its adult non breeding plumage. The eagle is still standing sentry over its unused nest on E Pool while the F Pool osprey parents are busy trying to keep their growing young feed. The little kingbirds are the most active bird on the Refuge today. Everything else seems to be just enjoying the sunshine after many days of gloom and rain. Our H Pool loon family is being elusive as usual. They are out quite a ways feeding their two young chicks. Something else we noticed was that the red-winged blackbirds must be gone…it’s very quiet on the Refuge now. They usual are raising quite a ruckus. The trumpeter swans are enjoying the overabundance of rain that has made pools where there wasn’t any before. They are feeding in place they never could before…like pigs in the muck. 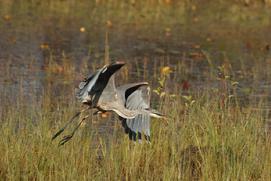 We spot a great blue heron on G Pool but it takes off before can we stop to ‘shoot’ it. A lone loon is out in G Pool preening. 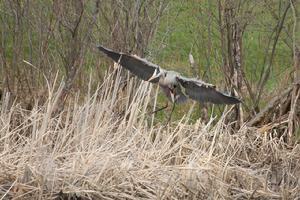 Another great blue heron is on the edge of D marsh but also takes off before I can get a shot off. 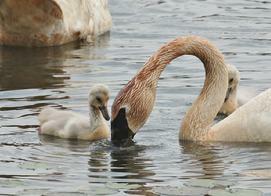 It looks like our west end E Pool trumpeter swans have lost one of their five cygnets…sadly. 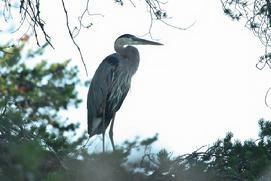 We spot another great blue heron on C marsh and yet another in a tree at the edge of the drive. But it, too, takes off. The darned buggers are not being very co-operative this morning. An osprey is enjoying a fish in the feeding tree on C Pool. I spot a male merlin trying to catch a songbird to no avail. Then we spot two loons out in C Pool. They seemed to be moving toward the shore so we decide to wait and watch them. Yes!! The gradually move right up to the shore. I get out of the truck to get down in the pucker brush to shoot them. It was amazing. They would dive then pop right back up in front of me!!! What a great morning!!! They did this for over a half an hour then finally worked back down the pool. 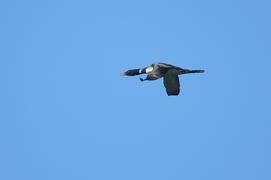 While we were watching the two on the pool four other loons flew over! 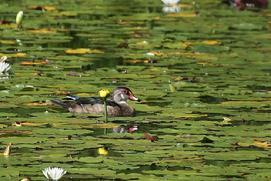 As we head down C Pool we have a wood duck in eclipse…morphing into his breeding plumage. Another loon is at the end of C Pool just chilling out. It is so beautiful out we decide to head back around to see if we can get any loon chick shots. An American bittern is in its usual spot but we had people ‘pushing’ us so we couldn’t get a shot. Also ABJ was on the other side of the drive feeding his one surviving chick. 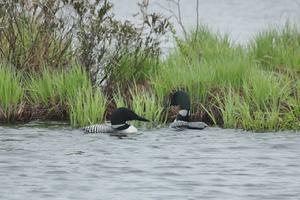 The chick has finally lost all of its baby down and has acquired the typical non breeding plumage of the adult loon. We stop to check on the H Pool loons. The male was up toward the shore feeding. The female was out with the two chicks in the middle of the pool. They got a little nervous when a sub adult eagle flew over the pool. It landed in a tree in the middle of the pool but eventually took off. J Pool loons still have their one chick. We spot an American bittern in an unusual place in H marsh but it flew off before I could get a shot. G Pool has two loons on it now. 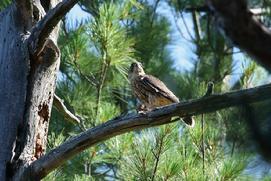 One of our juvenile merlins is calling. We heard that D Pool loons finally had a chick so I took off to investigate. I did get to see the little guy but the parents were keeping it away from shore. Hopefully, the little guy makes it. Usually the latest hatch is the first week of July. This one must have hatched the third week of July. We spot the same eagle over C Pool riling up the loons there. The osprey is still in the feeding tree. Things are quieting down as the day warms up. We head out around 2:00pm to take a break. Well we head back into the Refuge around 4:30pm it is 70 degrees with a slight breeze. The cedar waxwings are out feeding. I love to watch them flit through the air to catch a bug then back to a tree to eat it. We have a great blue heron in F Pool. 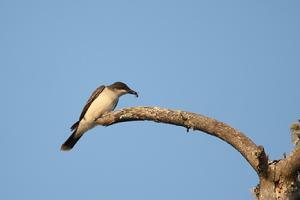 The eastern kingbirds are also very active. Kingfishers are out and about but very quiet. The osprey chicks on F Pool are hungry again. We have a juvenile kingfisher sitting in a bush along the west end of E Pool. It lets us get some shots and watch it catch a bite to eat. 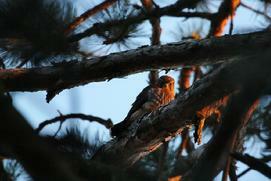 We spot one of the juvenile merlins sitting it their usual dead tree along the drive. I am able to get a few decent shots with the sun shining on it. The D Pool loons have their little one out feeding it in the setting sun near the drive. Unfortunately, the sun was not behind them making for some bad lighting. 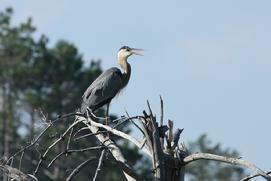 We also finally get a chance to ‘shoot’ a great blue heron in a tree…in the shade of course on C Pool. We also finally spot a pied billed grebe. We watch it as it takes a small fish and heads back into the cattails with it. Interesting…a possible nest in that area? We will be checking that one out next week. We finally head out about 8:00pm. Next week we will get an extra day to spend on the Refuge!! It is another gorgeous day on the Refuge…sunny, clear and 44 degrees at 7:30am. 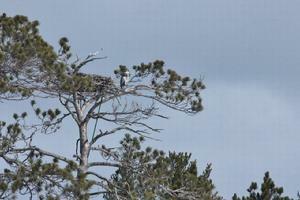 We spot the F-1 Pool osprey sitting above its nest guarding its young. The F Pool loons are out feeding near the start of F Pool where we run into Mark with his birding friend, Theresa. So we wander down to see if we can spot any rail activity. The F Pool osprey was guarding its two growing chicks. The trumpeter swans are now feeding heavily on F Pool. Unfortunately, the heavy rains have caused the marshes to be quite full of water…covering up the muddy flats that the rails and soras like to feed on. . When we got to one of the areas for the elusive birds we did see a sora or two and even caught a quick glimpse of the Virginia Rail…and even a VR chick!! 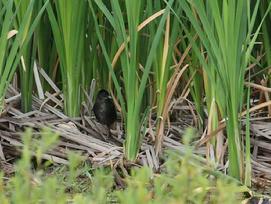 We also were able to photograph a Marsh Wren and a Wilson snipe in the same area. J Pool loon was next to the drive with their one growing chick but unfortunately we were not driving by while they were there. The one adult actually took off and flew right over us. It came back shortly and landed again. Then a car with a dog in it stopped and the one adult went into the yodel….warning them to leave. It was quite impressive to witness. Then what we assume was the female took off and didn’t return for some time. The females are starting to get social…leaving more of the parenting duties to the males. Sandhill cranes flying, kingfishers, flickers and lots of little birds out enjoying the beautiful morning. We have a great blue heron feeding in G channel. 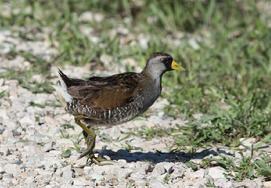 We get some good shots of a sora in E marsh. While we are watching the sora a fifth year bald eagle flies over G Pool and snatches a fish. What a great day to be on the Refuge!!! There are three loons have a small party on the west end of E Pool along with the family of trumpeter swans with their five cygnets. The kingfishers are squabbling with each other. Our fledgling merlins are begging for food. We stop to ‘shoot’ them. We got to see the momma bring in a snack for its one chick. The daddy was just sitting in the tree monitoring the fledglings and us. 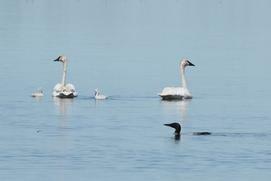 While we were shooting the merlins the daddy trumpeter swan came up near the shore followed by two of his five cygnets. He, too, wanted to make sure we weren’t going to bother his family. We final spot a pied billed grebe on C Pool. They have been few and far between this year sadly. We spot a female wood ducks with some ducklings feeding tight against the shore on C Pool but in the reeds too far to get any shots. Two momma ring-necked ducks were out with their tiny ducklings, too. We end our morning run at 12:30. It is starting to get more traffic on the drives so we decide to take a break till late afternoon. Well, the clouds moved in after 2:00pm so we didn’t head back on to the Refuge till after 6:00pm. Our American bittern is feeding in its usual spot along the drive. But everything is extremely quiet tonight. The trumpeter swans are tucked up on an island on F Pool already. A merlin flew over F Pool being attacked by kingbirds who I’m sure were trying to defend their young. We stop to check out H Pool loons but they are clear on the back side of the pool, of course. A great blue heron just caught a fish in F marsh. We watch it take it over to an open area and ‘play’ with it till it finally kills it and then eats it. A blue-winged teal momma is standing guard over its ducklings that were sleeping. 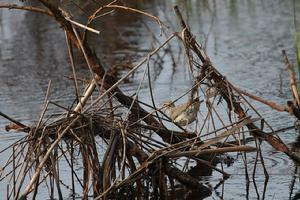 We are hoping it will clear off enough to get a chance to photograph the Virginia Rail and its chicks tonight. Mark was running a little late but despite the gloom we had fun seeing the little chicks that finally and quickly popped their heads out of the marsh. We actually ended up spending our whole time there till sunset. Hope to get back when the lighting is better and get a chance to see more of these elusive birds. It’s a gorgeous evening when we arrive on the Refuge. The skies and clear and the sun is out. Picture perfect! We take the Marshland Drive and were very happy we did. 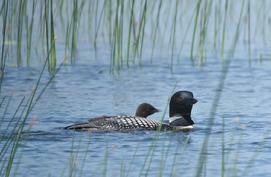 The loons at Seney National Wildlife Refuge have had their young. Four Pools have a total of six hatchlings to four separate pairs. As the chicks get older the males start to take over more of the feeding duties. The females are already starting to gather and socialize. They will be the first to leave in August then the males generally leave in September. Some males though have been known to stay till their young are ready to migrate with them. This was one of our first 'loon parties' last night. 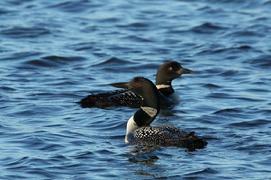 We had three loons socializing, diving and circling each other. It is always awesome to be able to witness special moments like these. They were so close to the shore...and then the two of them took off 'walking on water' in order to take off…totally awesome! The evening light was a perfect touch to the great photos I was able to capture. The two that took off were soon joined by three more loons. They were flying everywhere!! 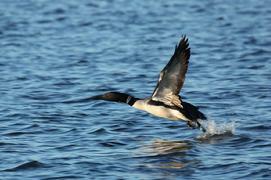 There is nothing quite as amazing to watch then a loon in flight! As we continued on our way, we ran into Mark Wilson again, of the YCC that is working on the Refuge this summer. 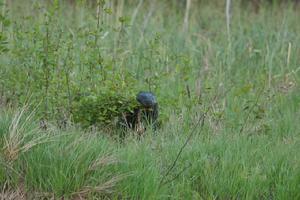 He was observing the two recently fledged merlins near their nesting area at the end of E Pool. We made plans to meet up with him the next to look for rails and soras. We headed into the Refuge at 8:00 on this gorgeous morning. Temps were in the 60’s and the water was still and calm. The wonderful aroma of flowering milkweeds, bracken ferns and pines mixed to make a perfume more fragrant than any Parisian perfume. We have an American bittern in the marsh that we photograph then turn and find the F Pool loons out feeding their two growing chicks which are about a month old now. When I get near the shore to photograph the loons another bittern flies out. Then yet another bittern flies across the pool toward us. Wow, finally, some action with bitterns. We spot a sandhill crane with its colt swimming across F Pool but they are out too far to get shots. Canada geese cover the islands on F Pool. 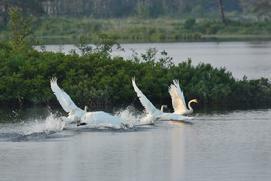 The trumpeter swans control E Pool. Our H Pool loons are on the back side of the pool. 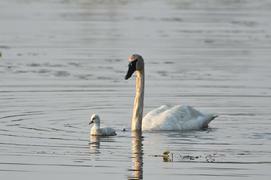 While I was trying to get back to them I was able to shoot the trumpeter swans with their one surviving cygnet. Then H Pool loons make their way to the front of the pool so I wander back that way to get a few nice shots. All of a sudden the one parent starts yodeling then hooting. Oh no, one chick is missing. My heart is in my throat. Then the little rascal pops up a few yards from the parents. Happiness reins again! These little ones are still so small they could easily be nabbed by a snapping turtle or pike. We finally spot J Pool with their one lone chick way on the back side of the pool. We amazed to watch as another loon flew in and landed on the east end of J Pool without the pair with the chicks making a peep. 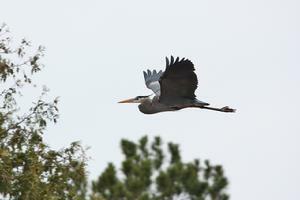 A great blue heron flies over J Pool and lands in a tree. As we head further down we spot two other GBH feeding at the west end of J Pool. The GBH that landed in the tree came over and landed in yet another tree. At that point one of the feeding GBH flew up as if to intimidate the other one…to no avail. Fun!!! Finally bitterns and great blue herons…what a great day! 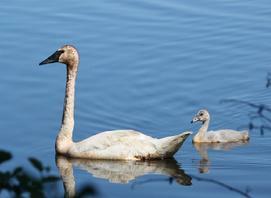 The west end E Pool trumpeter swans are out on the drive while their now five cygnets are feeding in the water. There seems to have been an altercation maybe between them and a pair that were on G Pool which were carrying on. Poor D Pool is very quiet. It doesn’t appear that the osprey’s nest has survived. The D Pool loons also don’t appear to have been successful in their second attempt at nesting. Time will tell. The C Pool osprey is just hanging out at its unused nest. There are several female ring-necked ducks with their young out feeding. B Pool loon is out and about. And we only spot one lone loon at the end of C Pool. So maybe a winner has claimed its new territory? We end our morning run at 11:00. We decide to pop down to the Wigwams to grab some lunch then back in to see if we can catch the H Pool loons closer to shore. 11:45 the F Pool loons are out showing off for the visitors. Our kingfishers are out chasing each other around but not being very co-operative. An American bittern flies out F Pool right at us. I got a pic but the light wasn’t very good. Oh well, at least we’re seeing them. Our H Pool loons are way on the back side of H pool so I decide to take a walk. I tried to situate myself in a seclude spot to wait for the loons to come by. But they decide to head the other way. So I take and stay low so they don’t see me. I was able to get some nice shots of them before they headed out to the middle of the pool. It was worth the heat, humidity and ticks to see these precious little ones. The heat is building and the wildlife is laying low…trying not to expend too much energy. So we head out of the Refuge around 1:45pm. Evening Run at 6:30pm but it is over 80 degrees and hot!! We have a great blue heron in a tree. As soon as we stop it flies back into a small dead tree. I decide to walk back to see if I can get some shots of it. I actually was able to get quite close considering there was water between us. Unfortunately, the poor thing was having a hard time swallowing. It was acting like it was trying to cough something up but just couldn’t. Hopefully, it will be all right. We have a juvenile hooded merganser in F Pool. Poor little bugger looked lost all by itself. J Pool loons with their one chick were a little closer to shore this time but still not close enough for photos. 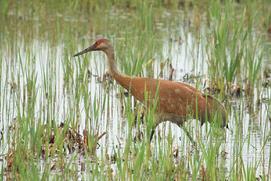 We have a pair of sandhill cranes that are in H marsh across from G Pool. The male tries to capture our attention while its mate is hunkered down in the reeds….with possibly a colt? Of course the G Pool loons are out near the shore preening but, of course, the lighting is terrible. We also have an osprey fishing in a tree right close to the drive…but the lighting again is terrible. Oh well, it’s nice just to see them. 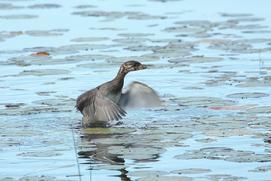 We have a pied billed grebe on C Pool. One lone loon is on C Pool where our ‘ladies’ were battling last night. Maybe we have a winner. 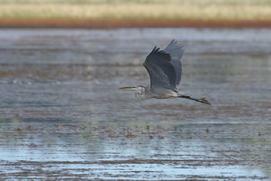 As we are leaving the Refuge we spot a great blue heron fishing in the marsh. We end our run after 8:30pm. We won’t be back till Saturday night. Wish we could be here more…someday. We arrived at the Refuge at 8:15pm tonight. It is a lovely 75 degrees. We have a female northern harrier fly over us before we enter the Refuge. We spot a great blue heron fishing in the pool in front of the Visitors Center. We are able to shoot it for quite a while in the beautiful evening light before someone else spooks it. I then got to photograph a kingfisher that stood still long enough for me to shoot it. An osprey is fishing over E Pool. The trumpeter swans are leisurely feeding. 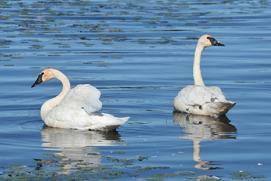 The trumpeter swans still have four cygnets midway on E Pool. There is a pair of sandhill cranes in C marsh feeding. The west end E Pool loons were out feeding their one large chick. B marsh sandhills popped up and startled us. We think they have a colt…the one was trying to distract us from its mate…which usually means they have a colt. Several ring-necked ducks have young on C Pool. We spot three loons on C Pool. We decide to sit and watch them. Two of them start belly swimming…then the fun begins!! 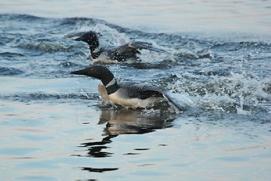 These two loons continue to ‘chase’ each other while swimming with only their wings. They actually look like penguins when they are doing this. We watch this behavior for over a half an hour. It is truly amazing when we get the privilege to witness such unique behavior. Another photographer comes along to shoot the action. We find out his name is Mark Wilson and he is working with the Youth Conservation Corp on the Refuge this summer. He tells us that these are two females that are challenging each other for this territory. Sadly, the resident C Pool female died recently so these two have moved in. Mark said that had been doing this same thing for several days now. Wow…I’m amazed that they can keep going. We are always amazed at what nature has to offer here on the Refuge. 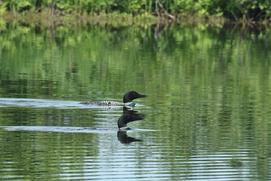 Two more loons were at the end of C Pool as we head out. These could possibly be the pair from the small pool that lost their young. Sad when the little ones don’t make. We woke up to overcast skies and 68 degrees. The weather shows a possibility of rain moving in. They really need it up here but it would be nice if it would hold off till Monday night. It is very quiet this morning the heavy humid air has everything moving slowly. Canada geese are feeding in F Pool. 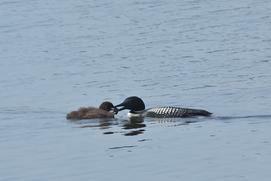 The F Pool loons are feeding their young along the Fishing Loop. 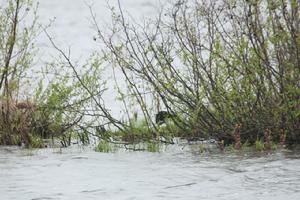 The muskrats are not daunted by the weather…they busily gather their sweet grass. F Pool osprey flew up in a tree near us after bringing its family breakfast. Yeah!!! Our H Pool loons have two tiny chicks riding on one of their backs!!! They even allowed us to take some photos and film them. 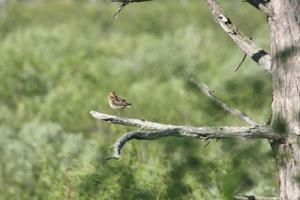 The snipes are chattering away in F marsh as usual. The trumpeter swans on H Pool have two cygnets. J Pool trumpeter swans have three cygnets. The E Pool eagle is fishing further down on J Pool. There is no sign of the J Pool loons yet. We have an osprey eating a fish on G Pool. 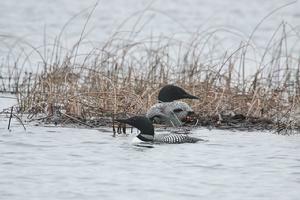 The loons are still together despite their failed nest. We also are treated to a young kingfisher that sits and poses for us for over fifteen minutes. One of its parents tries to get it to leave but it seemed to be enjoying itself with us. Finally, the parent flew at it and made it leave. .
A merlin is screaming near the D/E spillway. 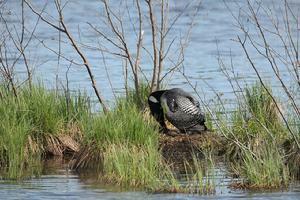 The wood ducks are still hanging on C marsh where the loon is sleeping waiting for its mate to incubate their eggs. An osprey is in the feeding tree on C Pool. Our trumpeter swans are out with their six cygnets but out too far for photo ops. Snipes are calling in B marsh. We have two different loons hanging out in different areas at the end of C Pool. While I was out looking for the small pool loons and their chicks that we were told had hatched, I got ‘attacked’ by a female merlin. I must be getting near her nesting area. I shot a few pics than left her and her nest alone. We ended on morning run at 12:00pm. I came back in around 2:00pm hoping to spend some time with H Pool loons but a fisherman was back by the spillway so there went that plan. The sun was coming out so it was really getting hot. I was surprised anyone would be fishing besides the loons. I was greeted by an osprey with a small northern pike in its talons. It was flying in circles and screaming. I think another osprey was trying to get its food. 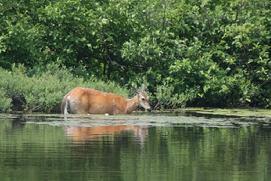 A doe waded into F Pool to enjoy the cooling water and the tasty water lilies. There are lots of trumpeter swans and Canada geese feeding in E Pool. The F Pool osprey is feeding its young. There are sandhill cranes in G marsh feeding. The G Pool loons are still enjoying each other’s company. They are on alert as they hear another loon calling as it flies. My one treat is the C Pool trumpeter swans at the end of the pool with their two cygnets came right up near the shore for me. I head back to the trailer to get Michael for our evening run. We head back in around 5:30pm to 82 degrees with partly sunny skies. 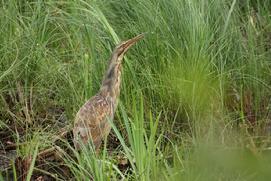 We are so excited to find an American bittern in a small swampy area across from F pool. The lighting was perfect. We were able to photograph and film it for over fifteen to twenty minutes. It finally got its fill and flew off. 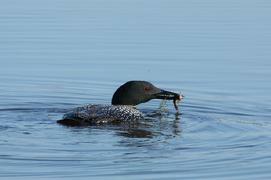 Then as we turn on the Fishing Loop we were treated to the F Pool loons feeding their young…in the sunshine!!! Then we have two great blue herons fly over us and across to the back side of F Pool where the osprey is guarding its young. 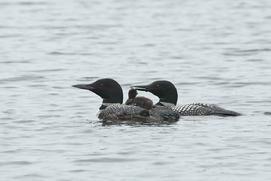 Our loons are out with their two little ones but the lighting is not good and they are out too far but that’s ok. It’s just nice to know they are doing well. There is also a pair of sandhill cranes back on H Pool, too. Along the west end of the Fishing Loop I hear a rustling in the tall grass. It was a big beaver gathering greens for its family. We can always count on seeing beaver here in the evening. We have a merlin causing a ruckus on G Pool where some ring-necked ducks are feeding. 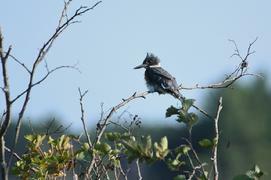 Our young kingfisher is flying and screaming around the area. We finally spot a pied billed grebe on the west end of E Pool!! Hopefully, we will be seeing some young next week. We spot one of the D Pool loons out in the middle of the pool but not the other…hopefully, that’s a good sign…and they are still nesting… time will tell. C Pool loon is guarding its nesting area. Further down a lone loon is feeding right next to the shore. The other lone loon is at the end of C Pool. 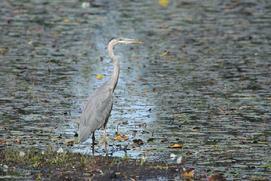 We also spot a great blue heron on the back side of the small pool. Around the corner we have two beavers enjoying the lily pads. We hear a great commotion of squawking blue jays and ravens…Michael said he has heard that sound before…when an owl was present. The birds harass them so much they have to leave. Sure enough, Michael catches sight of a huge owl taking off with the mob following. Too bad we couldn’t have gotten a shot of it. Not sure what kind it was. We head out at 7:30pm as the clouds move back in. We finally are back on the Refuge after being gone twelve days! It is 77 degrees at 8:20pm with a hazy building in from the northwest. The smells of summer fill the air on the Refuge…milkweeds are flowering along with wild yarrow, water lilies, bracken ferns…all blend together to make the perfect fragrance. ABJ and his family are out feeding on F Pool. The little ones are sure growing fast at three weeks old. E Pool is full of trumpeter swans as usual. The east end loons are out enjoying the evening together since then don’t have young to tend to. One pair of trumpeter swans midway has their four cygnets. We are so happy to see the west end loons have one chick. It looks to be at least a week old. The D Pool loons are out and about together…hopefully that doesn’t mean a failed nest…time will tell. 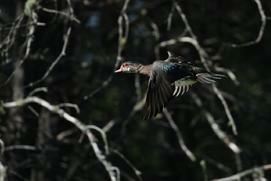 Some wood ducks spook up and fly to the back of C marsh. The C Pool loon is patrolling near the nesting area. C Pool trumpeter swans till have their six cygnets!! A lone loon is at the end of C Pool as the clouds move in over the sun. We head out hoping for a good day tomorrow. It rained sometime in the night and was overcast first thing in the morning so we didn’t head into the Refuge till around 9:45am. It is 74 degrees but very humid with only a slight breeze to cool things off. The wildlife seems to move slower in this weather just like their human counterparts. The trumpeter swans with their one cygnet are out feeding in F Pool along with many Canada geese and a couple of ring-necked ducks. We spot a great blue heron flying into the F Pool from the east. It first lands in a tree then on to one of the islands. I love seeing them in trees. They look so prehistoric. 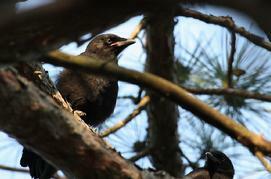 Our young fledgling ravens are squawking in the pine trees along F Pool. We are able to get some cute shots of them before we move on. The osprey parent is guarding their young in the nest on F Pool. The loon family is out too far for photo ops…again. J Pool trumpeter swans are out with their four little cygnets feeding. 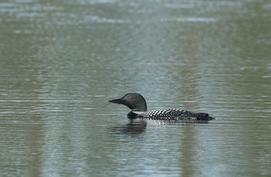 There is one of the loons patrolling the pool while hopefully the other is incubating eggs. The G Pool loons were out enjoying the day together. D Pool osprey was in the nest with the young…probably feeding them. 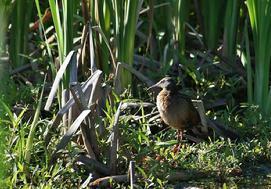 We have a male blue-winged teal just chilling on C Pool. I was able to get some nice reflection shots of him. The C Pool loon is guarding the area where its mate is incubating their eggs. 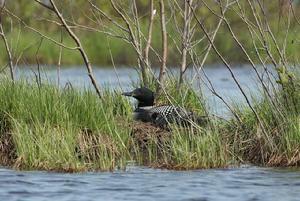 Hopefully, by the time we are back…in twelve days…we will see lots of new loon chicks throughout the Refuge. 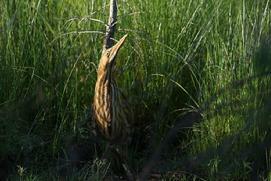 As we are nearly the end of the drive we spot an American bittern. We end our time on the Refuge at 1:00pm. We won’t be back till July 6. I’ll miss being here to watch the little ones growing. But I’m sure there will be more the next time we get here. We get back to Seney around 6:00pm with temperatures in the 80’s and humid. 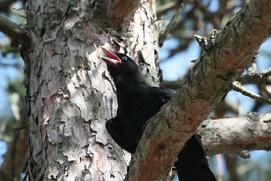 We stop to check on the young ravens that are just fledging. They are so cute to watch flapping and squawking in the trees. I love their eyes at this young age…they are a beautiful blue. The beavers and muskrats are busy as usual this time of the evening. The humid air has everything quiet. The osprey parents are guarding their young in their nest. One of them is fishing which at this stage of the chicks can be a continual task. The trumpeter swans with their young are out on the other side of F Pool where I’m sure the loon family is hanging out, too. We stopped to watch a beaver on the west end of the Refuge via the Fishing Loop past the G/J spillway. When I glanced up I just caught a wolf crossing the drive heading into the scrub brush to the west. Bummer, that we weren’t closer to get a shot but it totally disappeared by the time we got up there. 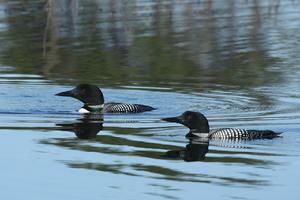 The G Pool loons are chilling out…swimming and fishing together at the south end of the pool. The trumpeter swans with their cygnets are feeding in the middle of the D Pool. An osprey is fishing over C Pool where the loon is still nesting. We end the evening around 8:00pm. We woke up to overcast and fog so we head into the Refuge around 9:00am hoping it will lift by the time we get there….but no luck. The temperature is a comfortable 64 degrees. We spot a pair of sandhill cranes at the beginning of the Marshland Drive. We think they may have a colt because they were acting very nervous. 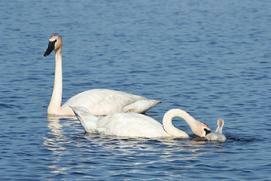 Our pair of trumpeter swans on F Pool is out with their one little cygnet. 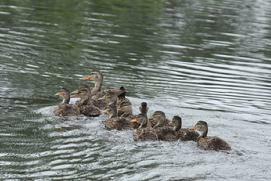 We also spot one of the juvenile common merganser along with a momma mallard and eleven ducklings! There is a large gaggle of Canada geese camped out on the east end of F Pool. Then we spot the F Pool loons in the mist out feeding their babies. They come in fairly close but the lighting conditions were definitely not the best. The trumpeter swans are all squawking and carrying on in E Pool. The osprey on F Pool is standing guard over its nest of young. There is one loon patrolling H Pool where we are hoping its mate is incubating eggs. We are estimating that they should be having young by the end of the month or first of July. There is a lone sandhill on an island in the middle of H Pool. Wilson snipes are calling in F marsh. There is also a lone loon on J Pool doing the same thing as the H Pool loon…guarding its mate and its territory. The drive on the back side of the Refuge along the Fishing Loop is green and lush with wild irises and cinnamon ferns…beautiful. On the west end of E Pool we have a pair of sandhill cranes feeding…but no colt. While we are watching them three loons fly over G Pool. Two of them land but the other one keeps flying. 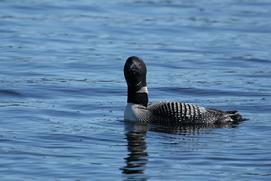 G Pool loons did not nest this year so they are out enjoying their freedom. The D Pool loon is out guarding its territory also. 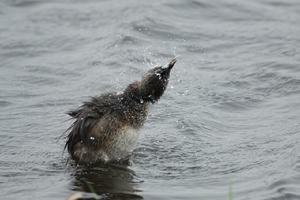 If all the nesting pairs are successful we should be enjoying baby loons in the next week or two. Exciting! 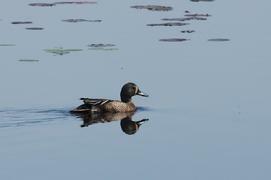 The green-winged teals are still in C marsh enjoying the eats. A yellow –rumped warbler is flitting about in the ferns. A few wood ducks are in C marsh feeding. 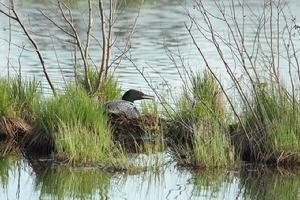 The loon is still incubating its eggs on their nest in C Pool. A trumpeter swan pair has six adorable little cygnets on C Pool. While we are watching them a loon flies in and lands on the pool. 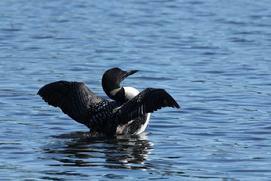 It is probably our territorial loon just out stretching its wings because we didn’t hear any warning calls. An osprey is fishing over B Pool and a common tern is fishing on the east end of C Pool as we end our morning run. The clouds have moved in and we decide to take a break until it clears. We get a call from some friends, Louise and Bud Olson of Mears, MI. They have learned to love the Refuge like us since Louise has been a facebook friend of mine. We meet them at the Visitors Center at 4:30pm. Louise rides with me in our truck while Bud follows in his own truck. Louise said he will enjoy the peace and quiet. The sun is shining finally but it is very windy. We spook a great blue heron out of the brush along F Pool. It was nice to finally see one back on the Refuge. 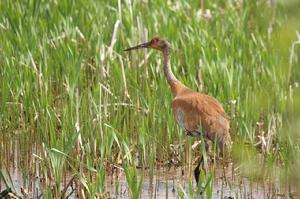 The sandhill cranes we had seen earlier DO have a colt. 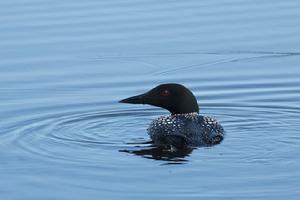 The F Pool loons are out with their young on F Pol via the Fishing Loop near the nesting area. 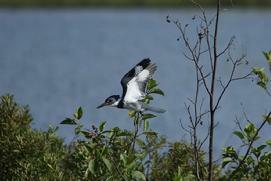 We have fun spotting beavers and muskrats, ring-necked ducks and trumpeters with cygnets. Everything seems to be quiet and trying to stay out of the wind. We say goodbye to Bud and Louise as they head to Whitefish Point and the ‘super moon’ while we take a last run through the Refuge at 7:30pm. 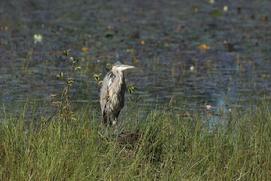 As we round the first corner of F Pool we spot not one but two great blue herons. We play hide and seek with them for a while. We had fun shooting a trio of young ravens just testing out their wings. We had heard them earlier but couldn’t see them. I think they are adorable with their pretty ‘baby’ blue eyes. We spot the sandhill cranes again with their colt but they make it head into the tall grasses before we ca get a shot of it. Well, the clouds start to move back in so we make a quick run and head back to the trailer around 8:30pm. We arrived at the Refuge around 8:00pm to overcast skies…but before we started the drive the clouds moved out!! 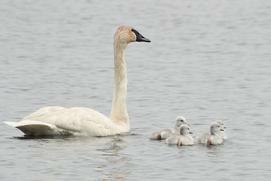 We found a trumpeter swan family with one cygnet on F Pool where a gaggle of Canada geese were congregated. ABJ and his family were enjoying the beautiful evening near the Fishing Loop. 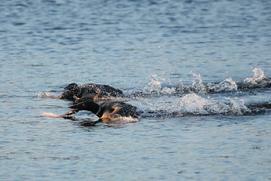 While we were watching them…a major battle took place along the Fishing Loop drive!! The territorial trumpeter swans were flailing the heck out of an intruding pair of swans. By the time we got near them the victorious F Pool swans were celebrating….the defeated pair were headed down the drive to E Pool. We watch the winning couple as they postured for us…enjoying themselves. Then in flies another pair of intruding swans. Well, off they headed across the water to attack this pair. I was able to get some of the cool action. They went after one while the other moved out of harm’s way. After they took care of that one… they went after the other one. Then they did the ‘happy’ dance to celebrate!! They are amazingly strong creatures and nothing to be messed with. Do not get too close to them…they may be beautiful and gentle looking but…they can be dangerous. 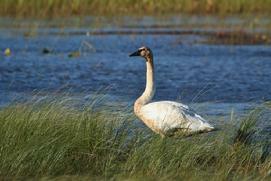 We take the Marshland Drive where the trumpeter swans are gathered in force. Our juvenile common mergansers are out feeding in E Pool. 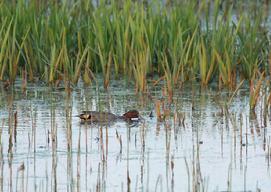 We spot an American bittern feeding in C marsh with sun setting on it. They we spot a pair of green-winged teals in the same area!!! We don’t see many of those around here so we enjoyed watching them for a while. The D Pool osprey chicks were chirping for dinner. 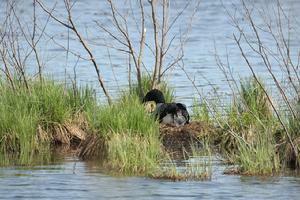 The osprey was guarding its unused nest on C Pool and the loon was still on its nest, too. 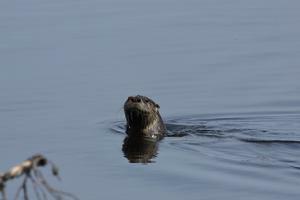 We spot lots of muskrats and beavers working throughout the Refuge. We spot another bittern flying over B marsh. We left at 9:30pm after an enjoyable peaceful…except for the fighting trumpeters…evening in our favorite place Seney National Wildlife Refuge! We woke up to a beautiful morning…cool but sunshine at 7:30am. 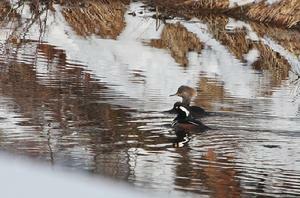 We spotted some juvenile hooded mergansers in a small pool along the Entrance Rd. 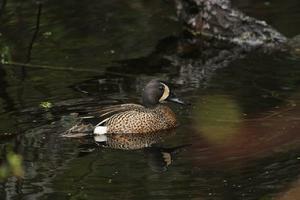 A male blue-winged teal was preening on a log in the small pool in front of Visitors Center. Eastern Kingbirds were flitting all around the area, too. There were lots of Canada geese flying and landing throughout the Refuge. The F Pool loons are still on their nest. If my calculations are correct it could be any day now! The trumpeter swans are covering E Pool…chasing each other around. We hear snipes calling in E marsh and F marsh. There is a Wilson snipe in a tree in H marsh preening and calling. The J Pool loons may be nesting…we only spot one of them. We spot a doe in H marsh. She circles around the area…possibly a fawn? G Pool has one loon near where we think they may have nested. 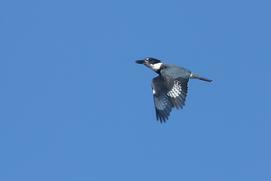 Another loon quietly flies over the pool. A bald eagle is sitting in the feeding tree on the west end of E Pool where a pair of ring-necked ducks has been keeping company. We spot another lone loon flying over D Pool. It is definitely a different loon. This one has a red band on its right leg…the other one had a white band. For such a beautiful morning…it is surprisingly quiet. We have a lone sandhill crane in B marsh. A lone loon is at the east end of C Pool. It is close enough to the shore to allow me some nice shots. I love being able to spend time with these beautiful birds. The morning light was ideal. We also spot a lone loon on the small pool at the end of C Pool…where we have seen a pair. So it’s hopefully another nest possibility. We end our morning run through at 9:30am. We have to head off to the tracks of the Toonerville to check on our black bears. We are back after a visit with the black bears. We have a momma with four tiny cubs!! It is now 76 degrees but overcast as we start our run at 5:00pm. Everything is quiet…Canada geese are throughout F Pool along with ring-necked ducks. The eagle is sitting in its pine tree on E Pool where the trumpeter swans are riled up. F Pool loon is on its nest the other one is keeping guard nearby. The osprey is laying low and keeping quiet in its nest, too. J Pool has more common terns on their island then we have had all season. A blue-winged teal flies over. The snipes are still calling. There is also one of my favorite Caspian terns sitting on a snag in J Pool. 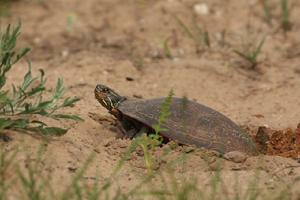 Painted turtles are laying eggs in the warm sand. At the J-G spillway a pair of shrikes stayed quit elusive but fun to try to catch. A male Northern harrier is being hassled in G marsh by an Eastern kingbird. They are definitely gutsy little birds.One of the G Pool loons is hanging near the island where we think they have a nest. Another Northern harrier is flying over E Pool and also being hassled by an Eastern kingbird. More snipes calling, bald eagle screaming on G Pool, Cormorants flying over E Pool, kingfishers fighting…a very busy evening on the Refuge despite the gloomy weather. I’m beginning to think the critters like it overcast and gloomy. LOL! The D Pool loons are still together but looking at nesting areas? They seem to always be the last ones nesting but they do seem to be successful lately. Yeah, we spot a loon on a nest toward the west end of C Pool. They had nested in the area last year but weren’t successful. Glad to see they are back trying again. B marsh has a pair of sandhill cranes relaxing with some Canada geese as their watch dogs. A beaver is out finding something to eat…out of the C Pool. Well, the bugs and overcast skies are working against us tonight…so we call it quits before 7:30pm. We headed in to the Refuge around 8:00am. It is 44 degrees with a hazy over the sun. We spot several beavers and muskrats out enjoying the quiet morning. A single trumpeter swan is riling up a pair of trumpeter swans that are nesting. It does the same thing to more than one couple on F Pool. The E Pool eagle is guarding his empty nest. One of the F Pool loons is on its nest. Common terns are fishing on F Pool. The osprey is sitting guarding its nest where its mate is incubating their eggs…hopefully. H Pool loons are still sticking close together as are the J Pool loons. 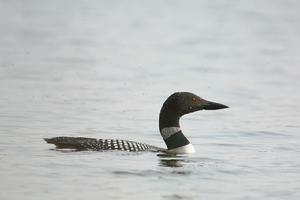 The G Pool loons are still going form island to island looking for the perfect nesting area. The osprey on D Pool was interesting to watch. At first we thought it had caught a fish then it dived back down into the water again and started bathing. 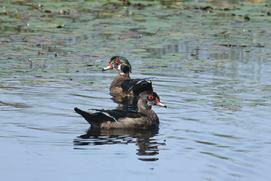 We spook a pair of wood ducks in C marsh. The ospreys act like want to start a family but…she’s not quite ready…so he takes off to sit on the ‘fishing’ tree in C Pool. I guess the wildlife is enjoying the quiet day today being that it’s a Holiday. Nothing is moving too fast…it’s a much slower pace today. We take another drive through. We were excited to see ABJ, himself, out in front of his nest on F Pool. We were in luck…he was just getting back on the nest. 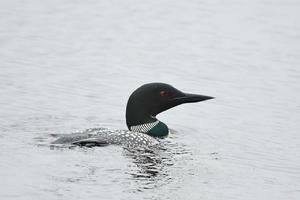 So I was able to shoot a series of photos showing how difficult it really is for loons to access land. They legs are situated on the very back of their heavy bodies making very cumbersome for them to ‘walk’ on land. Once he got back on the nest, he rotated the eggs before settling down to incubate. That is always so amazing to watch. We have a pair of sandhill cranes in F marsh. They get spooked and fly over to the E marsh. I guess that means they aren’t nesting yet. 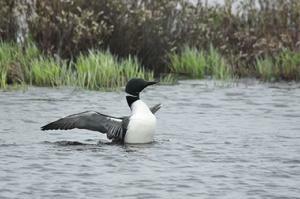 There is also a female hood merganser in F marsh but she, too, gets spooked and flies off. Caspian and common terns along with an osprey are fishing on H pool. 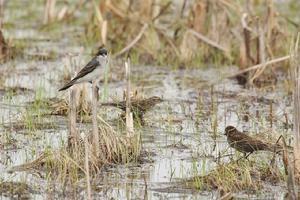 We stop to watch some Eastern kingbirds and red-winged blackbirds play and fight and chase each other in F marsh. 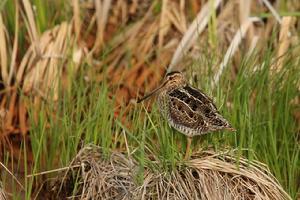 We also have a Wilson snipe flying and calling overhead as others call from the marsh. The J Pool loons are still just fishing and chilling out together. The common tern s are raising a ruckus on ‘tern’ island. 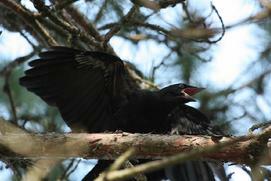 We spot a pileated woodpecker chasing a raven across and around D Pool/C marsh area. There is also a lone sandhill crane in C marsh. But as we watch it feeds then disappears into an area where we think it might have a nest. We’ll have to keep our eyes on that area. 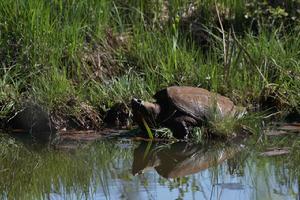 Unfortunately, there was also a huge snapping turtle relaxing in the same area…not a good thing for eggs and babies. 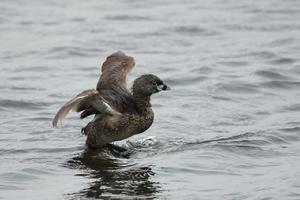 Further down on C Pool we spot a pied billed grebe that seems to be ‘protecting’ an area. There’s another spot we have to keep an eye on. A female blue-winged teal is along the shores of C Pool but takes off before we get to close. We end our final run through the Refuge around 1:30pm. We have to head home today and won’t be back till June 8…or 39th wedding anniversary. It is a gorgeous morning in the Upper Peninsula of Michigan. Temperatures are in the forties but sun and no wind make it pleasant. We head into the Refuge around 8:00am. There is a female hooded merganser in a little pool along the Entrance Rd. A sandhill crane flies over the Visitors Center as the red-winged blackbirds serenade us as we start down the Marshland Wildlife Drive. 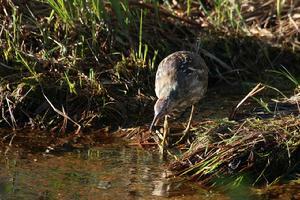 We spot an American bittern hunting in a little pool of water on the left side of the drive. Of course, it is on the ‘dark’ side of the road…but we were still able to get some decent shots of it. We also spot one of the F Pool loons out in the middle of the pool. As we access the nesting area we see that the other one is still on the nest. Poor thing is still being plagued by the blackflies…and with not much of a breeze, I’m sure it makes it worse. The Eastern kingbirds are out fighting and feeding. The Northern flickers are ‘flicking’ about…always one step ahead of us. There seems to be a few more trumpeter swans finally on nests. 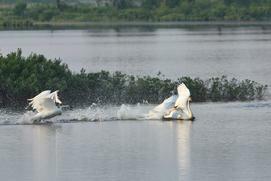 Also lots of territorial battles going on with the trumpeter swans…lots of fighting and flying around. The Wilson Snipes are calling and flying around H/J Pool area. Our H Pool loons are feeding along the shoreline. They allow us to photograph them for some time. We always maintain distance and always sit low in the brush so they don’t feel threatened or intimidated. The major priority is the safety and protection of the wildlife. This is their home… we are merely privileged visitors. 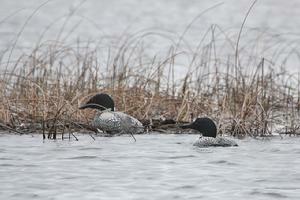 We also had a pair of blue-winged teals that were on H Pool but quickly left as we went by. The common terns are having a dispute on their island as the J Pool loons feed behind that area. On G Pool we have a merlin fly by us heading toward their usual nesting area. Ring-necked ducks and Canada geese are feeding on the pool. 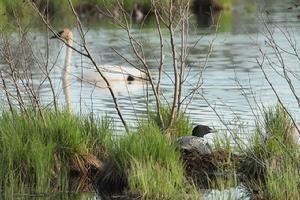 A trumpeter swan pair is nesting. We spot our G Pool loons on the south end still together. They call out as an eagle flies over. As we round the corner to D Pool a little female hooded merganser is quietly feeding. No sign of the D Pool loons. We spot a Northern harrier hunting over B marsh. C Pool has some ring-necked males squabble over a female. The ospreys are not at their nest yet. We have our deer still feeding in B marsh further down. Sweet, we have two loons squabbling on the northeast end of C Pool. They both bolted out of the water. The territorial loon kicked the other one out…although it attempted to come back. 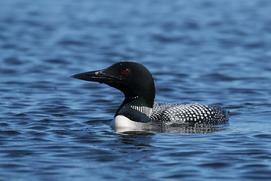 The territorial loon spent a lot of time close to the edge of the shore. It popped up right in front of me several times but didn’t seem to mind that I was there. It just kept a watchful eye out to the middle of the pool. It is so awesome to see these beautiful creatures interact together. While I was watching the loon a common tern hit the water nearby startling the loon. Then a male blue-winged teal flew right by me but it was too quick for a shot. 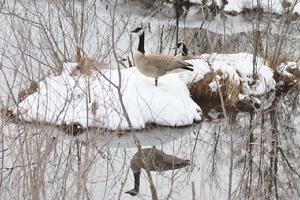 A pair of Canada geese has two small goslings on the little pool next to C where a pair of trumpeter swans is nesting. We end our first run of the day at 11:30am. Now we are heading to the tracks of the Toonerville Trolley to check on our black bears. We will be back later this afternoon to make another run through our favorite Refuge. We are back on the Refuge at 5:00pm. There are lots of people at the Visitors Center and out enjoying the drives but not as much activity with amongst the wildlife. We spot a white-tailed doe in the marsh. She looks like she is ready to have her fawn or fawns soon. We spot one of the F Pool loons out in the middle of the pool…and no one is on the nest. We can see two eggs so hopefully, at least one will hatch. J Pool loons are out together with the trumpeter swans that are tending their nest. G Pool loons are out and about. The one is ‘bathing’ making quite a splash. 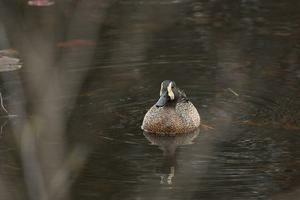 A blue-winged teal male is in the channel calling for a female. Caspian terns are flying and squawking over E Pool as an osprey flies by on its way to fish. The C Pool ospreys are at their nest…looking like they are thinking of nesting….but an intruder…another osprey flies into their territory. The male takes off after it followed by the female. 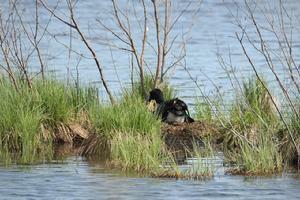 We see one loon on the south side of C Pool…so maybe they have started to nest? Time will tell. 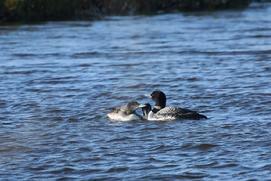 We have a pair of loons on the small pool at the end of C Pool! We’ll have to keep our eyes on them. The south show pool has some ring-necked ducks…the north pool has a male hooded merganser. We head back into the Refuge at 7:00pm to take a quick run on the Marshland Drive. 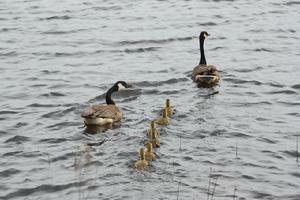 We spot a couple of different families of Canada geese with two goslings each. The trumpeter swans are carrying on. 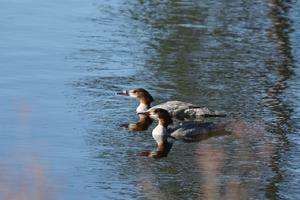 We spot two juvenile common mergansers sitting on a log in E Pool. The trumpeter swans have taken over an island on E Pool. It looks like it’s or ‘singles’ only. LOL. They are flying, chasing and dancing together. 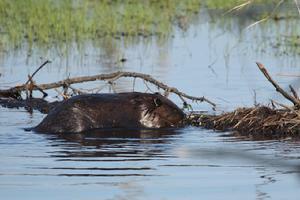 There is lots of beaver and muskrat activity going on throughout the Refuge. A male Northern harrier is hunting in B marsh. I love the harriers!! 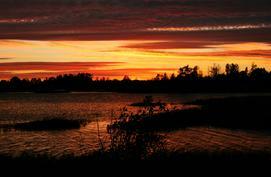 It is a beautiful end to a gorgeous day here at Seney National Wildlife Refuge. Despite the cold, wind, rain and gloom of the weather, the wildlife continues their struggle to survive. Whether it is courting, nesting, raising their young, hunting for food or protecting themselves from predators, the wildlife here on the Refuge is in constant movement. Some days when the elements are at their worst…is when you can see the most. Today for example…we could have just stayed in the warmth and comfort of our trailer…but we chose to explore. And we were greatly rewarded for our efforts. 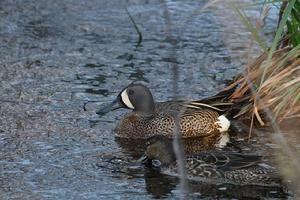 First we found our blue-winged teal couple feeding in one of their ‘areas’ near F Pool. It is always a delight when they don’t fly away. The Eastern Kingbirds were really enjoying the bugs this morning…catching them as fast as could be. 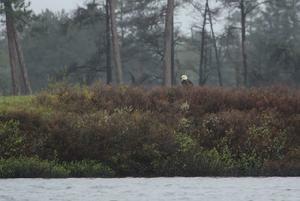 We spotted E Pool female eagle hunting from the ground on an island just off the Fishing Loop. It was interesting to just sit and observe her. One of the E Pool loons was nearby and on high alert. Then we found our F Pool loons back on their nest. It looks like the female was on the nest and ABJ was out further behind the nesting area resting. Hopefully, we are wrong and they weren’t off the nest too long. Only time will tell what will happen with this nest. We found an osprey fishing on H Pool. 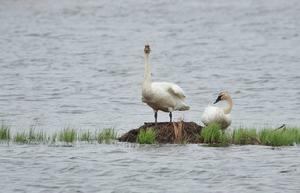 A pair of trumpeter swans seemed to be preparing a nest on an island on H Pool. We spotted the H Pool loons quite near the shore. We sat and to observe them. We were rewarded with the female actually crawling up on a spit of land attempting to build a nest. The male came over and slung a little mud for her but got disinterested and eventually swam away. She was calling to him but to no avail. It is so amazing to be able to witness the interaction of these loons. It is nearing nesting time for them. They will possibly attempt to build several nests before the perfect one is finally chosen. They are also very choosy about the area where they build the nest making sure it will be a safe haven for the young when they are hatched. Further down on J Pool a common tern was fishing. A couple of trumpeter swans were already nesting. 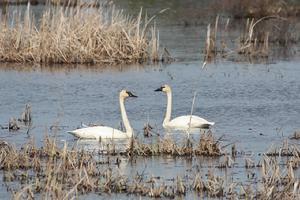 We also had a couple of pair of courting trumpeter swans. I also spotted something in the water. It quickly ran up the bank and across the bridge. It was a fairly large weasel (it had white under its chin). It was a little too fast for me to really get a decent shot, but cool to see nonetheless. As we round toward G Pool we spotted the loon couple there was also out ‘house’ hunting. We sat and watch them inspect several small islands but not really settling on one. They did at one point come up close to the shore for us then continued their search. What a great day on the Refuge!!! Continuing on the Caspian terns were fishing over the west end of E Pool where an osprey was also hunting. C Pool’s newest osprey nest had one osprey calling as its mate brought in a stick. Then the osprey took off to continue its search for the perfect sticks flying across C Pool and even B Pool in its quest. We are always excited to spot a Northern harrier. A female was hunting around B marsh which seems to be one of their usual haunts. As we were leaving the Refuge around 1:30pm we spotted an osprey fishing on the South Show Pool. It quickly caught a fish taking it across M-77. In a matter of minutes it was back to fish. It took a little longer. It also carried this one across the road but landed in a tree to eat this one. We’ll have to keep track of the area. So despite the weather….it was an awesome day on the Refuge!!! It’s always hard to head home but we will return Saturday night to check on all of ‘our’ wildlife and how they are fairly this season. After rain last night and this morning, we finally headed in to the Refuge around 11:00am. It looked like I might clear off…but no luck. Oh well, at least we get to spend time out with nature in a place we love to be. The one thing I love is the fact you never know what you may find around the next corner. Even if you did or didn’t see something in a particular area doesn’t mean that something will or won’t be there. That’s why you have to be ever vigilant always observing. We spotted our blue-winged teal pair but this time they were on the other side of the drive on F Pool. The male was once again on guard while the female enjoyed feeding. We hadn’t gotten far when the thunder started to rumble and the clouds move in. 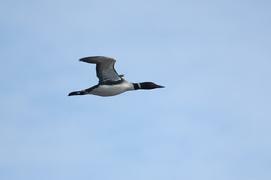 Ring-necked ducks flew in to E Pool where we saw one loon and many trumpeter swans. We also had a spotted sandpiper bobbing around along the shores of E Pool granting me a shot or two before flitting off. A little pied billed grebe was swimming very close to the shore along E Pool. I was able to photograph it as it bathed and preened as it swam right in front of me. Cool. The ravens and blackbirds seemed to be enjoying the wind and inclement weather. The red-winged blackbirds were attacking the marauding blackbirds chasing them out of their nesting area. Nature can be cruel one critters nest can be another critters dinner plate. We spot two cormorants flying over C Pool. We also spot our C Pool loons down near one of their old nesting areas. They got a little anxious when the E Pool eagle soared over. We also spotted an osprey fishing over B Pool. As they continue their swimming, I talk to them…and they come our way! 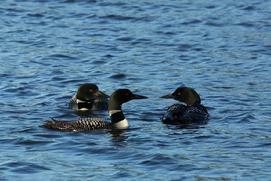 I know I get a little ‘loonie’ about the loons but seriously they did come right in near us. They were checking out the spit of land nearby seeing if it might make a possible nesting area. While we were watching them a crash of thunder sent them diving under the water. By the time they resurfaced the heavens opened up and the rain poured out. That pretty much ended our run through…it ended with an eagle flying over with a fish at the end of the drive. Hopefully, the weather will break but the forecast doesn’t look promising. We did make a late evening run through the Refuge. We had lots of muskrats and beavers out moving around. 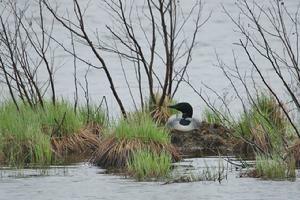 We were surprised to see one of the loons on F Pool nest. They had seemed to abandon it yesterday with all the bugs. Not sure what will become of it only time will tell. The F Pool osprey came by with a fish. It flew right over its mate that was calling for it but it ignored the mate. It headed to a tree to eat as much of the fish it wanted…before sharing. 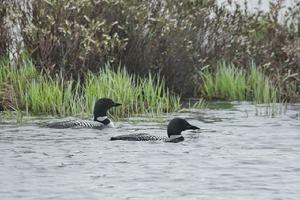 The loons seemed to be out enjoying the quieter weather. H Pool, J Pool, G Pool, D Pool and C Pool couples were out enjoying their time as a couple before the nesting and parenting begins in earnest. The C Pool ospreys were sitting on a tree close to their new nest. We spotted three deer in B marsh and a pair of sandhill cranes. We enjoyed a very peaceful evening on the Refuge despite the gloomy weather. We finally made our first run through the Refuge of the 2013 season!! It‘s always great to be back in this beautiful place. The day is a little overcast with peeks of sunshine. A very quiet start to the morning at 7:300am. We don’t spot much until we get on the Fishing Loop. Then we see a loon on E Pool along with one of the E Pool eagles sitting in one of the big pine trees next to their nest. Some Caspian terns are busy carrying food back across E Pool. ABJ is in front of his nest. We can see what we think is an egg but neither of the loons are on the nest. ABJ is doing a lot of diving. We figured he was fishing but on look at the photos notice there are swarms of blackflies all around him! Poor thing no wonder he is diving as much as possible to get away from the bugs. Hopefully the bugs don’t keep him and his mate off the nest for too long. We move along the drive find some wood ducks in the E Channel and further down blue-winged teals out in the F marsh along with the calls of several Wilson Snipes. Another Caspian tern is fishing over H Pool where we spot another loon. Last year’s failed osprey nest is no more. It looks like the winter winds must have taken it down. I spot a Wilson Snipe after hearing it calling. It is sitting on a tuft of grass in the E Pool marsh. But it takes off before Michael can get focused on it. The common terns are courting on their island in the middle of J Pool. We spot a pair of loons out on the other side of the island. One little pied billed grebe pops out of the water in front of us then disappears. 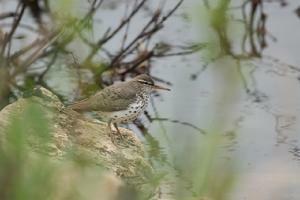 Further down we spot a couple of spotted sandpipers along with a pair of common mergansers. We have three ospreys flying around the north side of G Pool. No one seems threatened. One of them catches a fish and takes it to a dead tree to eat it. 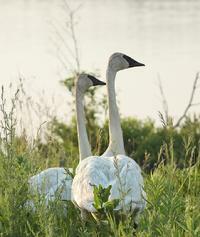 We spot a few trumpeter swans and Canada geese nesting here and there. A few ring-necked ducks are pairing up. D Pool we spot the G Pool eagle in a tree on the island then its mate flies up from the ground to sit by it. It would be interesting to know if they have young yet. Only time will tell. D Pool loons showed up near the observation deck but quickly moved on. The ospreys look like they are on the nest on D Pool. The one was sitting in a nearby tree. C Pool has a new osprey nest. The one osprey was eating while the other was gathering sticks. I wonder if it could be the couple from the failed nest last year on F Pool? While we were watching the ospreys the C Pool loons appeared swimming and diving together. It looked like the bugs were after them too. We have a few ring necked ducks at the end of C Pool along with a trumpeter swan. A couple of common terns were carrying on as they were fishing. B marsh had a couple of deer that hadn’t lost their winter coats yet. We watched a Easter Kingbird and some female red-winged blackbirds feeding in the marsh toward the end of the drive before heading out around 11:30am. Back on the Refuge this evening. The weather has finally gotten nicer…maybe a little too hot for this time of year but at least the sun is breaking through. 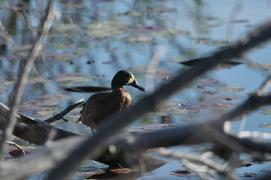 We spot a pair of blue-winged teals feeding in a little pool. He is just following her around as she feeds...making sure she is safe and happy. ..as any good man should. A little muskrat is feeding on sweet grass in the evening light. The beavers are out and about, too. We didn’t see any sign of the F Pool loons. We see one loon on E Pool via the Fishing Loop. 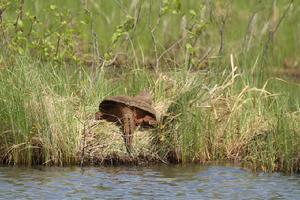 Further down we find a huge snapping turtle trying to be inconspicuous. We find a busy beaver working on a new damn back along the west end of H marsh. It was very interesting to watch it constructing it. 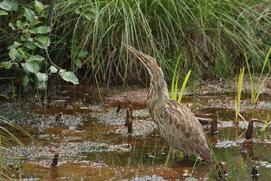 Along the back side of E Pool we hear the glunk glunk of the American bittern’s mating call. I love to hear that sound. Unfortunately, we couldn’t see them but that’s ok…just knowing they are back is great. We didn’t hear as many Wilson snipes tonight but we did hear some. 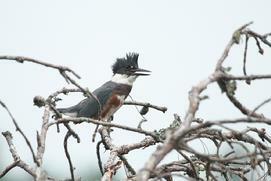 We had a few kingfishers, lots of northern flickers and some warblers along the drive. An osprey was landing in the nest on D Pool but no sign of the loons tonight. The ospreys were at their new nest on C Pool. It looks like the one is eating again while the other one works on the nest. 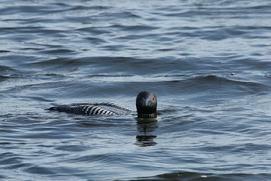 Yeah, a loon is swimming around on B Pool where we enjoyed watching them in the evenings last year. A beaver family was out for a swim at the end of C Pool where a family of Eastern kingbirds is feeding on flying insects. It is so fascinating to watch them. The sun is setting quickly as we leave the Refuge at 8:30pm. We’ll be back tomorrow! After an all-night rain, we woke up to the sun shining even though there was a brisk wind. We headed to the Refuge to see what we could see via hiking the Marshland Drive. The Refuge Visitors’ Center and Auto Drive officially opens tomorrow when we won’t be here. We immediately were greeted by a pair of trumpeter swans in F Pool along with some ring-necked ducks. 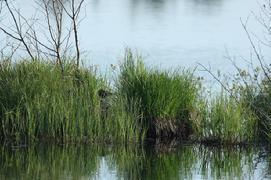 Just as I was going to continue my hike I noticed a beautiful great blue heron camouflaged amongst the reeds. We were able to photograph it for as long we wanted as it continued to fish. While I was photographing the great blue, a Caspian tern was also fishing on F Pool. It made several passes without much luck. There were three more terns sitting on a spit of land out in F Pool watching. We also had an immature eagle soaring high over F Pool enjoying the thermals. 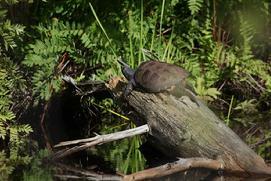 We didn’t get a glimpse of our loons today but….I spotted a large object swimming close to the banks in the shadows. 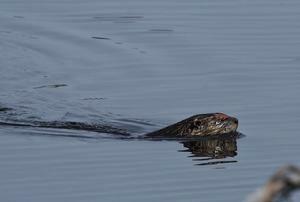 I wasn’t sure if it was a beaver or….was it a river otter? I got really excited but contain my emotions as I stealthy approached the area. Yes!!! It was a river otter as I had hoped. The little guy seemed lost. Maybe its momma had just finally kicked it out on its own. It actually came quite close to me as I sat quietly. At first I thought the little guy had a leaf stuck to its head but on looking closer realized it had been injured. It looked like the injury was healing but, boy, whatever ‘bite’ it got quite close to its eye….poor thing. We were entertained for quite some time watching as it went from one cove back to another calling. It finally moved away from the shore. Hopefully, it will be fine on its own and we will meet again someday. We felt very honored to have been able to spend some time with this precious creature. As we were heading back down the drive to our truck an osprey flew over with a very large fish it had just caught on F Pool. 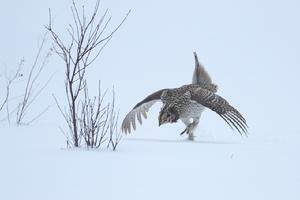 It looked like it was heading out to the nest on M-77 with its catch. Just before we got to the end of the drive our great blue heron flew right in front of us. It had been fishing on the opposite side of the drive and must have decided the fishing was better back where it had been originally. It was the end to a perfect few hours spent on our Refuge. The skies were hazing up and the black flies were waking up. Thank goodness for the wind. We’ll be back Saturday night to check out our old haunts. 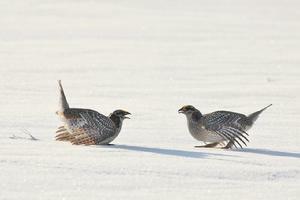 Its sharp-tailed grouse count time again. This is the first year we had to trudge through snow to get there! It has been a long winter in spring. We head back to the blind before daylight with the temperature at 27 and a slight northwest wind. 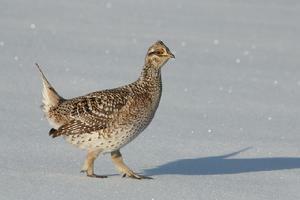 As we near the lekking area we don’t hear or see any grouse. In the past three years that we have been coming the grouse have usually already started their dancing before we get to the blind. Oh well, maybe they don’t like the snow. Time will tell. We take our readings and start filling out the paperwork to get ready to start our count. We figured it would just be zeros…but just before I started the stop watch in flew several STGs. We started the count with the sun just starting to break over the hill. As we were filming, the clouds moved in from the northwest to obscure the sun and the snow started to fall. Oh well, at least we have something to count. Typically, the male grouse will dance…then stop in mid stride…then start right back up, like someone push there on/off switch. But this year the males seemed to partner up…two of them dancing at each other then slowly stop and sit down jabbering and staring at each other. There were only three females that flew in later but didn’t stay very long. I’m sure they weather may be a factor in this. Who would want to start a nest in a snow pile? The sun amazingly broke through before the count was over. I was able to get some great shots of these unique birds. The snow definitely helped with photographing and filming. 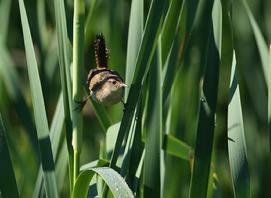 Usually we are trying to focus on a brown bird in a mess of brown grasses. We did have a couple of ravens fly in and hassle a couple of the males STGs that we to the north of us. 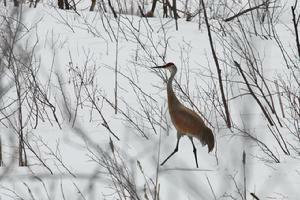 Then a pair of sandhill cranes flew in and landed in the middle of the snow covered field. I’m sure they are wondering what month this is…April?...looks like February. About a half an hour after the count was done…the grouse flew off to the north. Perfect! As we were heading back down the trail to our truck, we were treated to a wonderful surprise. 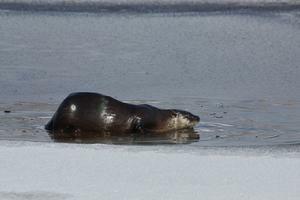 A river otter popped out of the ice on Diversion Ditch!! Awesome!!! 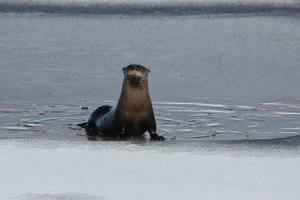 It was curious enough to let me get a few shots of it before it disappeared back under the ice. Further down we spotted a pied billed grebe and male and female hood mergansers enough the open water of the ditch. As we were heading down Driggs River Rd. we spotted a fisher crossing the road. It was definitely a great day on the Refuge!! We are back up to the Upper Peninsula to bring our trailer back for the season. 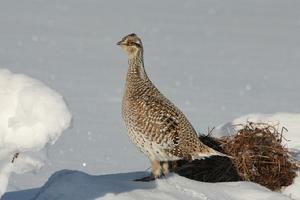 We are scheduled to count sharp-tailed grouse on Sunday and Monday. This makes our 4th year of volunteering for this count. We stop in to pick up the backpack that we will need for the morning. As we enter the Refuge we spot a pair of Canada geese starting to build their nest even in the snow. We even startled a Wilson Snipe who must be a little confused about this weather. We also spotted a pair of trumpeter swans out on the south show pool along with some hooded mergansers. We popped back into the Refuge after our STG count. The geese were still busy working on their nest. We were surprised to see a great blue heron sitting next to the osprey nest on F-1 Pool! Maybe he’s thinking of starting a rookery on the Refuge. LOL! 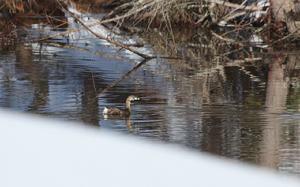 We also spotted a pair of wood ducks in the ditch south of the south show pool where the trumpeter swans were sitting on the ice and the hooded mergansers were courting. 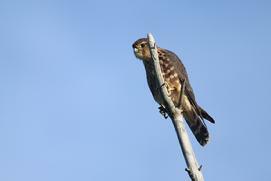 A merlin flew out of a tree at the Wigwams and headed south then into the Refuge. 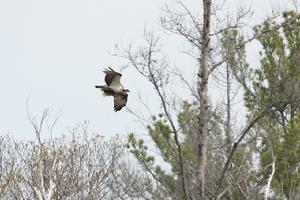 As we were heading back to the trailer we spotted an osprey checking out the nest on M-77. So spring is here whether the weather is co-operating or not. It is definitely hard to believe it is the middle of April but this too shall pass…and spring will arrive…eventually.